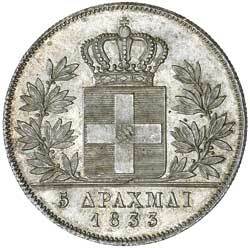 GREECE, Otto, silver five drachmai, 1833 (KM.20). Attractively toned, underlying full original mint bloom, uncirculated and very rare in this condition, one of the finest known, an outstanding type coin. GREECE, Otto, silver half drachma, 1833 (KM.19). Toned, nearly extremely fine and well struck. GREECE, George I, fifty lepta, 1883A (KM.37). Good extremely fine/nearly uncirculated. 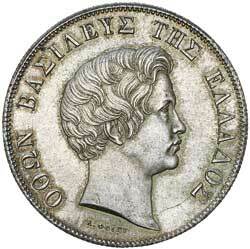 GREECE, George I, fifty lepta, 1883A (KM.37). Toned, nearly extremely fine.